OMAHA, Neb. (CNS) — The bishops of Nebraska called for repeal of the state’s death penalty and reform of the criminal justice system. “For this reason, the Catholic bishops of Nebraska, guided by prudence and the teaching of the church, support legislative efforts to repeal the death penalty and reform our criminal justice system,” the bishops said. The same day at a news conference in Topeka, Kansas, representatives of a various conservative organizations joined a Republican state representative in urging passage of a bill that would replace the death penalty with a term of life in prison without the possibility of parole for anyone convicted of a capital offense. 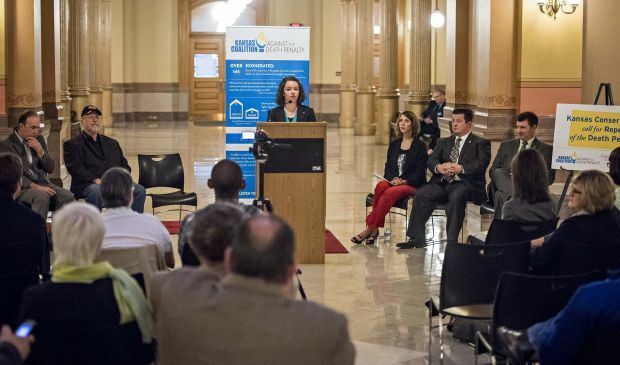 Laura Peredo, president of Ravens Respect Life, a student pro-life group at Benedictine College in Atchison, Kansas, said at the event that states can protect the public and punish criminals without resorting to the death penalty. “As more Americans, especially young adults, identify as pro-life, our consciences call us to uphold a consistent life ethic by opposing all threats to human life including the death penalty. We are the pro-life generation and this belief informs the way we approach life issues,” she said. The news conference followed a Feb. 11 letter calling for an end to capital punishment sent to Kansas legislators by more than 430 religious leaders including Archbishop Joseph F. Naumann of Kansas City. Momentum has been building in the Nebraska Legislature against the death penalty, said Greg Schleppenbach, executive director of the Nebraska Catholic Conference. A bill to replace capital punishment with life imprisonment without parole, advanced 8-0 March 9 from the Judiciary Committee, the first-ever unanimous vote for repeal from the committee. The full Legislature could debate the bill next month, Schleppenbach said. The Nebraska Legislature is unique because it has only one chamber. A similar bill advanced to the floor in 2013, but proponents were unable to overcome a filibuster. This time, a number of lawmakers have co-sponsored the bill and many new senators have expressed support for repeal, as have some victims’ families, Schleppenbach said. Advocates such as Nebraskans for Alternatives to the Death Penalty have been encouraged by positive feedback on the bill, he said. The three bishops said they have great compassion for families affected by acts of profound violence. There is evidence nationwide that innocent people could be executed and that a disproportionate number of racial minorities and poor people are sentenced to death, the bishops said. “We are deeply troubled by a justice system in which the innocent might be executed, and in which race, education, and economics might play a factor in a death sentence,” the bishops said. In addition, there is no clear evidence that executions deter crime, public safety can be assured through other means and while justice requires punishment, “it does not require that those who have committed capital crimes be put to death,” they said. The Kansas news conference was called in the state Capitol by the Kansas Coalition Against the Death Penalty and Conservatives Concerned About the Death Penalty as H.B. 2129 awaits a hearing in the Kansas Legislature. Ron Keine and Ray Krone of Witness to Innocence, an organization composed of and led by exonerated death row survivors and their family members, spoke in support of the bill. Kansas Gov. Sam Brownback, who is Catholic, has not taken a stance on the bill. In a Feb. 28 interview with Catholic News Service, he said he was opposed to the death penalty in cases other than when society cannot be protected from a perpetrator and that he wanted to examine the bill’s language before deciding whether to support it. Contributing to this story was David Gouger in Omaha.